Alarm and security solutions for the home owner. Alarm Pro Muskoka Limited installs custom-designed, affordable alarm systems to provide property protection and peace of mind for you and your loved ones. Let us help determine the security solution that is right for you. Have peace of mind knowing Alarm Pro Muskoka Limited is safeguarding your premises with an alarm system that will alert police to all emergency alarm signals from your security system providing you with protection 24 hours a day, 7 days a week, 365 days a year. We offer 24/7 on call technicians and monitoring at the central station. Home & cottage alarm & camera solutions. Reduce your insurance preimums by installing a monitored alarm system today & ensure your home and most valued posessions are protected. Remote control of your alarm and temperature. Receive email and SMS notifications. Alarm Pro Muskoka Limited can also offer Home Security Cameras & Video Surveillance Equipment. For those times when your busy life takes you away from the people you love, let Alarm Pro Muskoka Limited help provide your family with the peace of mind they deserve while allowing you remote access to see that everything’s all right with your own eyes. 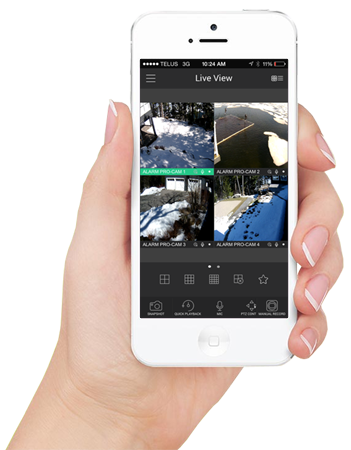 With Alarm Pro Muskoka Limited surveillance equipment, you can view the video feed of your home, cottage or business from almost anywhere in the world using a web-access computer, cell phone or PDA! We can also connect a TV or dedicate a monitor to enable you to view the video feed right from any room in your house! The security surveillance video is safe and only available to you for viewing. Get a free estimate for your home or cottage security installation. Our technical and customer support will keep your system up and running to help you protect your home and family and give you greater peace of mind. A single Alarm Pro Muskoka Limited system will notify you of burglary, vandalism, fire, smoke, high levels of carbon monoxide, high and low temperatures, flood and more. An Alarm Pro Muskoka Limited Security system can help reduce insurance premiums by up to 20%. Check with your insurance provider, often reductions will offset monitoring costs. Anything you would like to be notified about. We will come up with a solution to your notification needs. Alarm Pro Muskoka Limited, Home and business security solutions throughout Muskoka. Copyright © 2019. Web services by: Kamerge Inc.